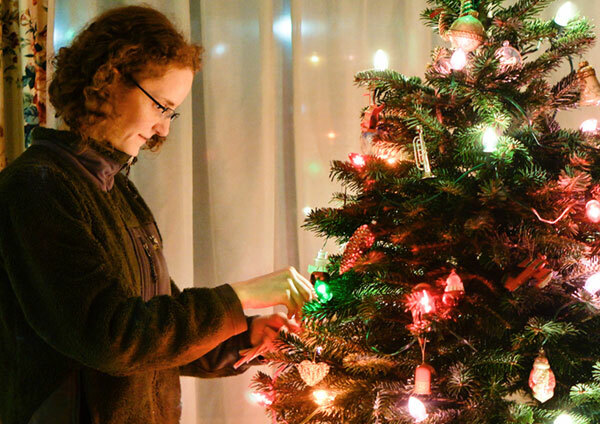 At our house, decorating the Christmas tree is a festive family tradition. 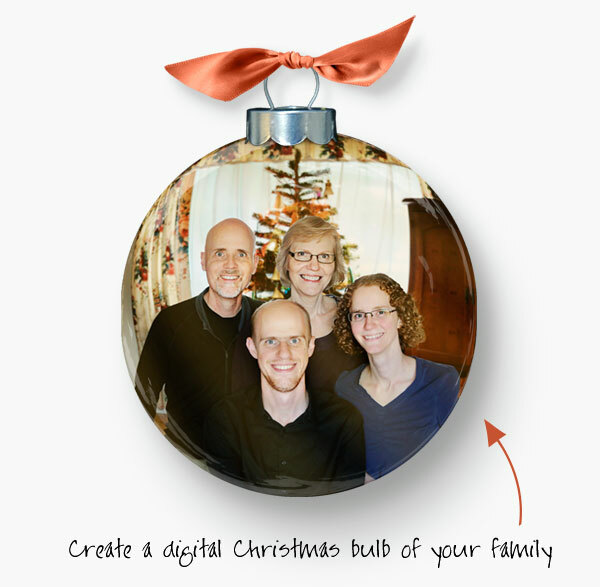 Shiny or decorated bulbs constitute a significant percentage of our Christmas ornaments, so I thought I would share a tutorial on how to create a digital Christmas ornament using a favorite photo. 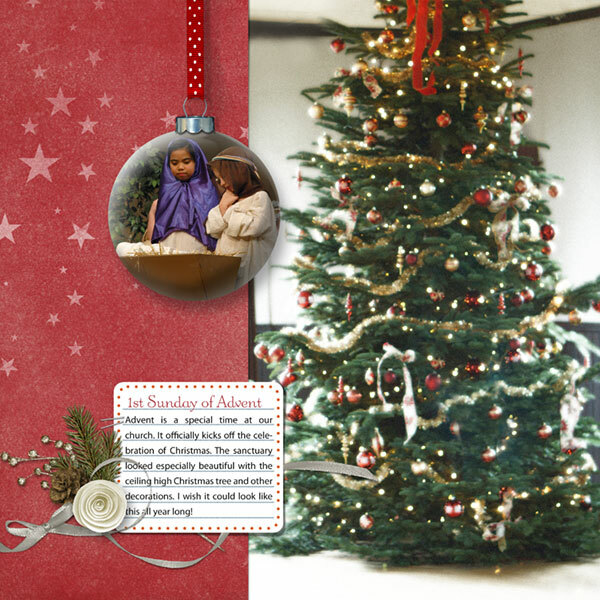 An ornament makes a great accent on a Christmas scrapbook page, adding just the right amount of WOW factor. If you want to feature a group photo, try to place everyone in a more circular arrangement, and leave plenty of space around the edges. I took this photo of my family using the timer on my camera. Use a string of bulbs on a Christmas card. For this example, I “hung” the ornaments on a garland, which I created using my Christmas Garland Brush and Glitter layer style. If you’ve been around this site for a very long time, you may remember me teaching this tutorial before, but I’ve updated it and made a video to show you exactly how it’s done. It’s very easy, by the way. Even beginners can do this, so give it a try! To create the ornament I used the Spherize filter, which gave my photo a slightly distorted rounded look. I also used a glass globe template from my class All Season Snow Globe to give the ornaments a shiny round look, but in this video I teach how to create a spot reflection using another filter—the Lens Flare filter. Ornaments need a hanger to hang on the tree, so download this free hanger to use with your ornament. 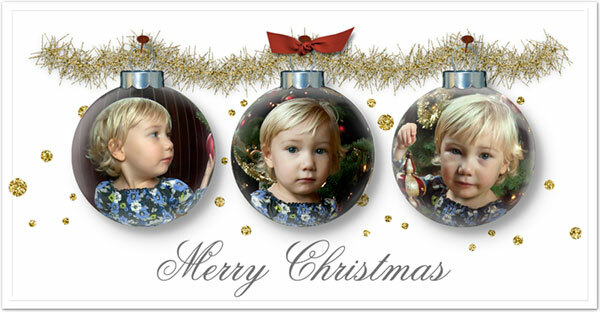 Click on the video below to watch how to turn a photo into a Christmas ornament. Written instructions are below the video. Be as creative as you want making your own Christmas baubles using two filters that will magically create the illusion of a round sphere. Love this tutorial, thank you for posting it! Question, when I attempt to make my circle it cuts out black? I have no idea how to see the pic. It does the same with the custom shape tool. Any suggestions?? Thank you! I wonder if you’re accidentally using the wrong tool. The Elliptical Marquee tool doesn’t cut anything or change anything. It simply creates a selection outline. You may be accidentally using the Cookie Cutter tool which does cut your image. The Custom Shape tool won’t work either. The Elliptical Marquee tool is different than the Ellipse tool found with the other shape tools. You’ll find the Elliptical Marquee tool in the top section of the Tool Bar. Most likely the Rectangular Marquee will be visible, but click on that and open Tool Options, and you’ll see the Elliptical Marquee icon. Click on that and then try it again. It sounds like you may be accidentally using the wrong tool. Perhaps you’re using the Ellipse tool, one of the Shape tools. The tool you need is the Elliptical Marquee tool. It’s near the top of the Tool Bar just under the word SELECT, the one on the right. You may see the Rectangular Marquee tool there with dashed lines. Click on it and then click on Tool Options at the bottom of your screen to see options for that tool. Click on the oval dashed line icon on the left to get the Elliptical Marquee tool.